Whether you are a regular reader or have just stumbled upon us this week, you can count yourself among the many members of Team 1p. We have had a great response to the researchers featured thus far and the good news for all of you is that we have a lot more really exciting interviews lined up! In a minute you’ll be presented with this week’s interview, but first – grab yourself a cup of tea or a mug of coffee and join us in ye olde coffee house that is Penny University, all are welcome. Ahoy! 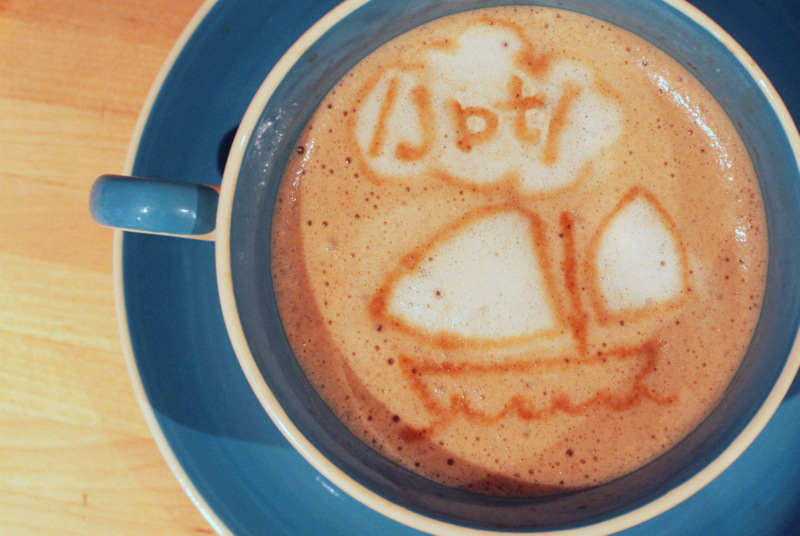 ‘Tis a /jɒt/ sailing upon the calm waters of Latte Harbour. Dean Wybrow is a final-year PhD student at the University of Essex. He is researching the subtypes of developmental dyslexia. DW: I don’t think I’m alone in having become interested in developmental dyslexia through having a family member with the condition, and I was always stimulated to find out more about it. My early teaching on the subject was from Rhona Johnston at the University of Hull, and I am grateful to her for giving me the knowledge base to work from. I am currently working on my PhD with Rick Hanley at the University of Essex, and we are investigating the methods by which researchers identify surface dyslexia in a population of dyslexic children. There has been some controversy surrounding the kind of control group that is appropriate for comparisons with dyslexic children, and there are technical reasons why neither a control group matched for age nor a control group matched for reading ability are appropriate. AA: Interesting. So if I understand you correctly, you are in a sense… researching the way that other people have been researching dyslexia? DW: That’s not a bad way of putting it! Researchers have come to some conclusions about dyslexia that may be incorrect because the studies that brought about those conclusions were flawed. In my thesis, I’m trying to find a new method that eliminates some of the problems that have occurred so far. AA: Can you tell me a little bit about the problems concerning selecting the participants and control groups – and why this is important to research on dyslexia? DW: Certainly. For a long time, researchers have hypothesised that people can have various kinds of dyslexia, depending on the aspects of reading that are problematic for the invidual concerned. There are two types that I am concerned with, and these are phonological and surface dyslexia. Phonological dyslexia, to put it simply, is where the person struggles to sound words out, but can remember unusual words adequately, and surface dyslexia is where the person always sounds words out, even when that is not appropriate (consider what happens if you try to sound out knight or yacht!). The kind of research I am doing estimates how many people in a group of dyslexics have phonological or surface dyslexia by comparing them to different control groups. In dyslexia research, a control group is a group of people that are not dyslexic, and have no other neural disorders. However, they need to be the same as the dyslexics in some way or another – for example, the controls can’t have ages that vary from 8-80 if all the dyslexics are 11 years old, as that would not be useful. The controls can have the same average age as the dyslexics, or they can have the same average something else, such as reading ability, IQ, spelling ability, and so on. Some studies used a mixture of same-age and same-reading ability controls and found that, while they could find lots of phonological and surface dyslexics with same-age controls, they could only find phonological dyslexics with same-reading ability controls. This suggested that surface dyslexia is not functionally different from not having read enough books, whereas phonological dyslexia appeared to be caused by a fundamental neural problem in the brains of those involved. However, some people have noticed that the tests the researchers used to measure reading ability were biased in favour of the phonological dyslexics, potentially skewing the results. I am currently re-doing this research without using either same-age or same-reading age controls. AA: It sounds like it is definitely important to make sure the control groups are correct for the results to be useful. When you get results from this type of study, what are they used for? DW: Well, the ultimate goal is to provide teaching methods in schools that enable as many children, dyslexic or not, to learn to read as possible. This will only happen once we are confident that we have discovered all the reasons for this process to go wrong. In the context of the kind of research we are discussing here, the problem lies in whether there are children who might not be best served by the current method of teaching – phonics. To understand why this is, I need to go back a bit. Most researchers agree that the most common cause of dyslexia is what’s called a phonological deficit. This is a deficit in the ability to store the sounds of words in memory, so that the distinctions between some sounds are fuzzy and not easily distinguished. This in turn makes it difficult to relate these sounds to letters on the page and therefore sound words out. This is what I referred to earlier as phonological dyslexia. Phonics helps these children by explicitly teaching how to sound words out and therefore alleviate the problem caused by the phonological deficit. Surface dyslexics, on the other hand, seem to have no trouble sounding words out, and in fact do it all the time, and instead seem to have problems storing the written forms of words as wholes (in a hypothetical storage module called the orthographic lexicon). Therefore, instead of recalling a word and thinking, “I know that, it’s yacht”, they sound it out, and may give a response that rhymes with matched. If these children can sound words out well, and have a deficit in another area of processing, they would be better off being taught by a method that includes something specifically geared towards that deficit. It probably doesn’t do them any harm to learn phonics, but they might become better readers with some additional method. As for the debate about control groups, if a group of surface dyslexics aren’t functionally different from younger readers of the same reading ability, it suggests that perhaps they have no specific deficit at all, and maybe just need to read more books (amongst other things), in which case there is no need to develop a specific teaching method for them. If the tests used to measure reading ability were biased, then it throws doubt on the ‘not enough books’ theory, and hence we are still investigating the best method to do this. AA: Let me see if I’ve got this right; we all sound out words when we’re learning to read and then when we learn new words, but for surface dyslexics they continue to do this – even if they’ve encountered the word before. What you’re trying to do is identify these children who take the test, because you think it’s not just a case of ‘not experiencing as many words as other children’, but maybe something more. Is that right? DW: Yes. We’re hoping to show that children with surface dyslexia are actually impaired in their ability process words as complete units rather than simply being behind their peers. AA: Can you tell us any interesting results from the research so far? DW: Yes, we have just analysed the results and it seems to have turned out as predicted. We replicated the results from previous studies when using the old analysis methods, but when we used our new analysis method, we found that the numbers of surface and phonological dyslexia were more equal. In fact, most of the children (nearly 60%) had problems reading both nonwords and irregular words. We call these children mixed dyslexics. AA: Wow, dyslexia is a lot more complex than I thought – especially with so many different ‘types’! It definitely sounds like your results will be helpful in identifying these children with different forms of dyslexia (and this in turn will help them get the assistance they need)! It has been a very interesting introduction to a subject that many of us have experience with, but perhaps don’t know a whole lot about on a research level. Thanks so much for taking the time to share it with us today. I hope you’ll get back to us with more of your results in the future! DW: No problem. Thanks for inviting me to the Penny University, and thank you to the readers for reading. Dean Wybrow is a final-year PhD student at the University of Essex. If you’re interested in learning more about Dean and his research, you can visit: Academia.edu/DeanWybrow. If you are near the University of Essex in Colchester, you can sign up to take part in experiments here.